say, have you ever seen my family's fake coat of arms? well, then. as the story goes, when world war one went down and we were on the outs with deutschland, my great-grandfather (great-great-grandfather?) on my mom's side decided to...decrease the likelihood of personal political difficulties by making our extremely german family (the wagners) temporarily french (the de la tours). not one to rely solely on his ability to act french,* my ancestor backed up his cover story by creating a big, flashy signet ring with a coat of arms (the ol' tour) and a motto (tiens ta foi). who, after all, would bother to cook up fake heraldry and a fake slogan for a fake signet ring for the fakey mcfakersons? a shifty german, obviously, but it apparently worked (or was never needed at all, who knows). 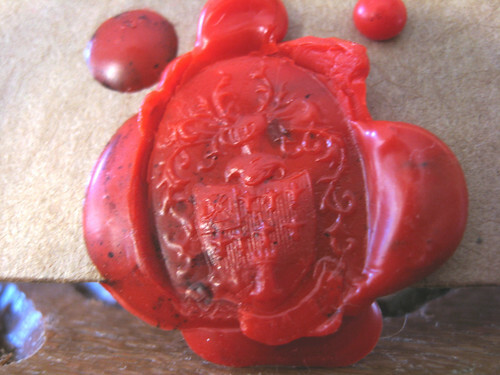 i'd forgotten the story of the bogus seal, but my mom used it on my birthday package,** which reminded me that i want desperately to inherit that ring. em and baby jo can forget it right now. *i come from a long line of bad liars. on that side, at least - dad's is full of attorneys. **how, one wonders, would old wagner feel about his motto stamped on a j.crew card? the american dream works in mysterious ways.